This is the final bus stop for Blackberry users. If you are still glued to your old Blackberry Smartphone, it is time to sow it as a seed to someone else or separate the battery from the phone and keep it in a safe place for reference purposes. The first blow that kept Blackberry unbalance was when Whatsapp discontinue supports for Blackberry devices, this extensively affected their market share and caused Blackberry to bow to pressure by producing her first Android powered device in 2015 called Priv. However, Priv failed the company, failed the city and failed her customers; hence T-Mobile, one of the largest retail store in the US have stopped the sale of Blackberry Priv, AT&T one of blackberry Allie also backing out. CEO John Chen said in October that the company would exit the smartphone business, which has been on life support for years. 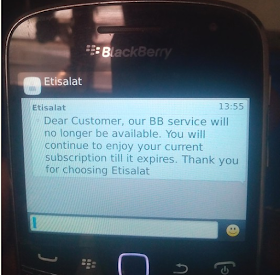 And now, Etisalat have discontinued Blackberry Internet Services also known as BIS subscriptions. Here is the message they sent to their Blackberry subscribers. So what do you have to say about this?